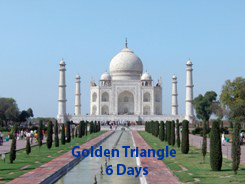 India's Golden Triangle includes the three most visited cities in the country's northwest corner, Delhi, Agra and Jaipur. This area has been dubbed "golden" because of the vast wealth of cultural and historic treasures to be found in these three cities. From the majestic Taj Mahal in Agra to the fascinating abandoned city of Fatehpur Sikri, this golden land beckons with the mystery and complex cultural drama of India.